Lord Elis-Thomas addresses the Codi'r To members at the Senedd buildingYear 6 pupils from Ysgol Maesincla, Caernarfon and Year 5 pupils from Ysgol Glancegin, Bangor who ‘raised the roof’ and ‘brought the house down’ with their new-found musical talent when they visited the Senedd Building recently. Codi’r To, a community regeneration project, is based on the world-famous El Sistema system. As part of Sistema Cymru, Codi’r To provides innovative and engaging musical instruction to children from disadvantaged areas and since 2013, has been working with schools in Communities First areas in Bangor and Caernarfon. 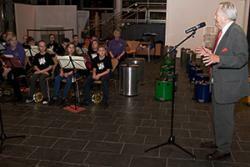 After enjoying a guided tour of the Senedd building by their host, Lord Dafydd Elis-Thomas, AM for Dwyfor Meirionnydd and Chancellor of Bangor University, the pupils set up with their instruments in the Senedd’s main reception later in the evening. The pupils gave a half an hour performance to display their incredible progression from total novices – most of whom had never held a musical instrument prior to their involvement with Codi’r To – to players of an eclectic medley of musical pieces, all within a matter of months. Accompanying the pupils and their teachers were Bangor University Pro Vice-Chancellor, Professor Jerry Hunter and Delyth Murphy, Head of the University’s Widening Access Centre. Bangor University has invested in the Codi’r To project by obtaining the expertise of academics across the institution who have, along with the delivery of the music tuition, been conducting research on the project’s effectiveness. The final stages of their evaluation are currently underway and their findings will be published in the coming months.